Agreement means the Quote together with these terms and conditions or if no Quote is issued, these terms and conditions. Amount means the amount stated in the Quote, Initial Invoice and/or Final Invoice as the context requires. Business Day means a day that is not a Saturday, Sunday, bank holiday or public holiday in Western Australia. Dangerous Good means any firearms or Goods which are or may become of a dangerous, corrosive, highly combustible, explosive, damaging or noxious nature or are likely to encourage any vermin or pest. Debt has the meaning given in clause 7(b). Delivery Address means the address identified by the Client as the delivery address. Final Invoice has the meaning provided in clause 5.5(a). Goods means all furniture and other property which are to be the subject of the Services. Initial Invoice means an invoice issued to the Client prior to completion of the Services pursuant to clause 5.4. Packing Box means a cardboard packaging box loaned by the Contractor to the Client pursuant to clause 8. Performance Date means the date on which the Services were first performed in whole or in part. Pick Up Address means the location where the Goods are collected. Quote means the quote for Services which may be provided by the Contractor to the Client and annexed to these terms and conditions. Services means the services that the Contractor shall perform under this Agreement as may be described in the Quote and any additional services provided in accordance with this Agreement. Service Provider means the Contractor or the subcontractor as the context requires. Service Vehicle means any vehicle used to perform the Services. Valuable Good means jewellery, precious objects, works of art, antiques, money, collections of Goods or any valuable equipment, and all Goods valued over of $1000. (e) no provision of this Agreement will be construed adversely against a party because that party was responsible for drafting the provision. The Contractor reserves the right to use external subcontractors to perform the services. (a) Unless expressly stated to be an agreement to perform the works for a fixed fee, the Quote is a non-binding estimate of costs only. (b) A fixed fee Quote is valid for a period of 5 Business Days after the Issue Date. (iii) the date of the move. The Client acknowledges that changes to these details provided by the Client may result in significant increases to the fees charged (including for fixed fee Quotes) for the Services. The Service Provider will provide the Services in accordance with this Agreement. The Client is deemed to have accepted, and is bound by, the terms of this Agreement by instructing the Contractor to proceed with performance of the Services. (a) Unless expressly stated in the Quote to be performance of Services on a fixed fee basis, the Contractor will charge, and the Client will pay, for the Services in accordance with the Schedule of Fees. (b) In providing the Services, the Service Provider is entitled to a 15 minute break for every two hours worked which is included in calculating the total hours worked for the purpose of the Quote or the Final Invoice. (viii) the Client asked the Service Provider to park the Service Vehicle in a place where the Service Vehicle became subject to a parking fine. (a) Within one Business Day of instructing the Contractor to provide the Services, the Client is required to pay the Deposit. (b) The Deposit will not be refunded unless the Contractor terminates without cause pursuant to clause 12. (a) The Contractor may require the Client to pay an amount which represents its reasonable estimate of the fees which will be payable in respect of the Service (including taking into account any variations) at any time before the Performance Date or completion of the Services by providing the Client with an Initial Invoice. (b) If the Client fails to pay the amount of an Initial Invoice upon demand, the Contractor may immediately cease providing the Services and retain any Goods in its possession in accordance with clause 7. (iii) in the case of a fixed fee agreement, the value of any variations made under clause 5.2, valued in accordance with the Schedule of Fees. (b) The Final Invoice must be paid by the Client to the Contractor upon delivery of Goods at the Delivery Address. (d) If the Amount paid pursuant to the Initial Invoice exceeds the value of the Services as set out in the Final Invoice, the Contractor must refund the overpayment within 5 Business Days of completion of the Services. (vi) unload the Goods at a location of its choice, including a warehouse or other storage facility. (b) The Service Provider will be entitled to charge an additional amount for transport, labour, storage and for any subsequent re-delivery of the Goods when action is taken in accordance with clause 6(a). (c) Risk in the Goods remains with the Client at all times. (a) The Goods are subject to a general lien for any outstanding amounts owed by the Client pursuant to this Agreement. (b) The Contractor reserves the right to retain the Goods in the event that there are reasonable grounds to believe that the Client is unable or unwilling to pay any amount payable to the Contractor under this Agreement (Debt), until such time as the Debt has been paid in full. (c) If the Debt remains outstanding for 10 Business Days after the date for payment of the Final Invoice stated in clause 5.5(b), the Contractor may sell any or all of the Goods and apply the proceeds to satisfy any part of the Debt that is outstanding. (d) Any costs associated with the storage or sale of such Goods will be borne by the Client and also recouped from the proceeds from the sale of Goods under this clause 7. (a) At the written request of the Client, the Contractor will loan to the Client up to 40 Packing Boxes [at no additional cost to the client]. (ii) be collected by the Contractor from the Delivery Address 10 Business after the Performance Date. 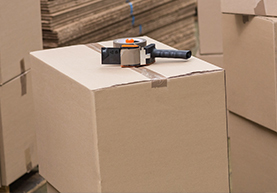 (c) If any Packing Box is returned to the Contractor in an unusable condition (in the sole opinion of the Contractor) the Contractor may charge, and the Client will be obliged to pay, the replacement cost of the unusable Packing Box. The Service Provider reserves the right, at its sole discretion, to refuse to accept the carriage of Goods for any reason. other than as has been disclosed to the Contractor in writing prior to the Performance Date. The Contractor may terminate this Agreement without cause by giving at least five Business Days’ notice to the Client. (viii) are pre-packed Goods and the Goods were not packed by the Service Provider. (e) If the value of the damaged Goods cannot be agreed between the Contractor and the Client, the value of the damaged Goods shall be assessed, at the cost of the Client, by an independent valuer according to the age and condition of the item (not its replacement value). (f) Any damage to the Goods must be reported to the Contractor in writing before the Service Provider leaves the Delivery Address. These terms and conditions may only be amended by an agreement in writing signed by a duly authorised representative of each party. The Contractor is an independent contractor performing this Agreement. This Agreement does not create any agency, partnership, employment or other joint relationship between the Service Provider and the Client. All payments due to the Contractor under this Agreement must be paid in full without any set-off, counterclaim or deduction.